HIT THE ROAD—in your new Corvette. Pictured are members of the Grand Valley Corvette Association, Dave Bailey of Kool Chevrolet and winners of the new car. From left is Roger Davis, GVCA member, Dave Bailey, Laurie Allen, wife of winner Gary Allen, Jon Henningson, GVCA member, Cheryl Davis, GVCA president, Gail Schuiling, GVCA raffle chairman and Gary Allen. This makes up for the flowers he didn’t get her on their 40th anniversary this July. 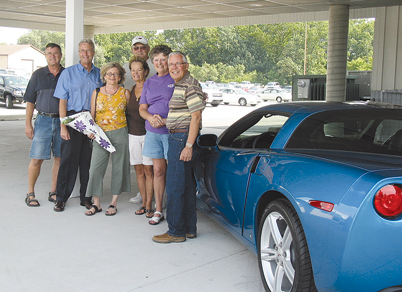 Gary Allen, morning host of newsradio wood 1300, was the lucky winner of a 2009 Corvette, a car that sells in the $50,000 range and boasts about 435 horsepower. The car was the prize for this year’s Grand Valley Corvette Association annual raffle, which the club has been holding for 28 years. 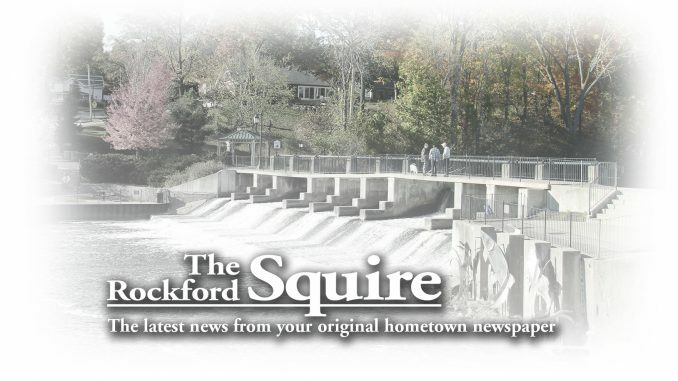 The ticket sales for the raffle were sold out this year, and allowed the club to give a $15,000 check to an organization for Downs syndrome children and $15,000 check for a Spina Bifida foundation. In the 28 years of the raffle, the group has raised and donated just under $600,000. The couple took possession of the vehicle on Monday, September 14 at Kool Chevrolet on Plainfield Avenue. Laurie, Gary’s wife, said that in their family, she has always driven the cars without automatic transmission, so this car should be hers. “He always lets me be the one to drive the sticks, so I guess this is my car,” she stated. Allen said he thought the first trip in the car would likely be a nice color tour around the state. She said more information on the club and their annual raffle can be found at grandvalleycorvette.org. Still, it’s not too bad to have the car, either. “Thank you and get away from my car,” joked Allen. Bailey said the fundraiser is a lot of fun and he enjoys participating. He invited people to come on down to Kool and get in line up to buy tickets for next year.